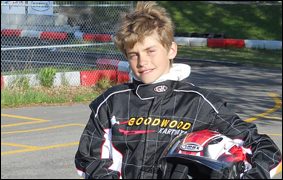 Bjorn is ready to compete in the Canadian Rookie Karting Championship (CRKC) at Goodwood once again. He had another great year competing in 2016 and we're confident that he'll have numerous podium finishes again in the 2017 season! Bjorn had an incredible finish to his 2016 race season by qualifying P1 for his Finals race and holding his lead the entire race for the win. It was an extremely exciting race to watch and we're hoping for many more in 2017. Join us track side to cheer on the karting team because we expect many more exciting races like that one to follow! Bjorn shows his passion and excitement for motorsports when you watch him roll out onto the track. He's very excited about the 2017 race season and it shows, whether he's out practicing and competing against himself or racing against others! With many lessons learned from previous years, he says he's looking forward to "stepping it up a notch" in 2017 and we have no doubt that he will do just that. This year he'll focus on advanced techniques, from trail braking to him prioritizing sections of the track. Bjorn will also be logging many more hours of track time this year for practice to get his lap times down to a new personal record. Bjorn is also contemplating adding additional practice time to his schedule and potentially racing at Canadian Tire Motorsports Park (CTMP), formerly Mosport International Raceway. Adding CTMP to his practice schedule and potentially racing there in addition to Goodwood will definitely be an additional and exciting challenge. 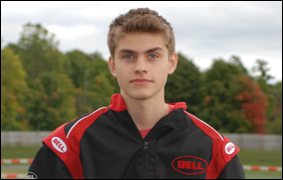 Even more exciting than adding CTMP to his schedule is the potential to get behind the wheel of the Corvette on a development track! 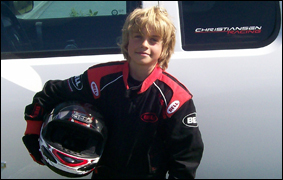 Going from a race kart to a race car will be an unbelievable step up for him and the learning curve will be steep. Bjorn Christiansen taking a break after qualifying. After talking to Lou Gigliotti's team at LG Motorsports, we picked up one of their vented carbon fiber hoods.